XLRI : News - From Campus & Alumni: 'Mafoi' Pandia Rajan (IR84) - From Rs 60,000 to Rs 435 crore! 'Mafoi' Pandia Rajan (IR84) - From Rs 60,000 to Rs 435 crore! Rediff's special article on Amazing story of Pandia Rajan and Mafoi. An amazing story: From Rs 60,000 to Rs 435 crore! Today Ma Foi Management Consultants is the largest HR services provider and staffing company in India, with a turnover of Rs 435 crore (Rs 4.35 billion). Ma Foi has so far helped generate career opportunities for more than 169,000 people in 35 countries. K Pandia Rajan started it in 1992 with a capital of just Rs 60,000. 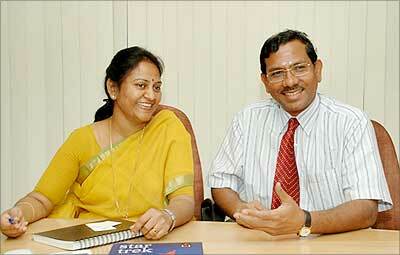 Ably assisting him in his long journey has been his wife, Hemalatha Rajan, who is also the director of the company. Pandia Rajan was born in Vilampatti village in Sivakasi district. His father who was a worker at a match factory died when Pandia Rajan was just three months old. He was brought up by his grandparents in a joint family of about 40 to 50 people. Later his grandparents started their own match factory. After studying in the village school, the hard-working boy went to Coimbatore to study engineering at the PSG College of Technology. Having stood first in the university, he joined XLRI, Jamshedpur for his MBA. That, he says, was where the seeds of entrepreneurship in the HR arena were sown in his mind. "At that time, HR guys never became entrepreneurs, but I wanted to study HR and then be an entrepreneur. In my village too almost everybody is an entrepreneur. Unless you are on your own, you are a nobody there. So, you can say the entrepreneurial spirit is deeply ingrained in all of us." But he had to wait for some time. After working for six years, and getting married to a chartered accountant (Hemalatha) in 1989, he and his wife decided to put all their dreams together in their own enterprise." But why a French name? "We were targetting the international market. So, Ma Foi -- or My Word -- is a name that meant something to all European countries. It gave us an occasion to speak about our value to the clients. Ma Foi' symbolized what we wanted to say and do." With an investment of Rs 60,000, they started Ma Foi in "a small shack of a place." But by the end of the year, four of their friends put in Rs 10,000 each and upped the investment to Rs 1 lakh (Rs 100,000). They started primarily by placing engineers overseas. The Chennai office, which opened at 6 a.m., remained open till midnight so that candidates could walk in and register any time. "Although it was a struggle initially, we wanted to position ourselves as a candidate-centric organisation. About 30 to 40 people visited us every day. It was 1992-93 and the Gulf region was booming. We sent dozens of middle-level and managerial people at that time to countries like Oman, Saudi Arabia, Kuwait, Malaysia, Brunei, etc. . ."
Even as visa processing began, the Babri Masjid was felled. All Gulf nations put a ban on issuing visas to Indians. And Ma Foi's losses ran into lakh (hundreds of thousands). "It was a tough phase and we had to pledge even our jewellery. But when we came out of the struggle, we expanded into all kinds of things." By 1994, a lot of multinational companies made their entry into India. By the end of 1994, Ma Foi got a huge offer from Apple Computers to recruit all their heads of departments. "That was also the time the salaries in the Gulf region started falling. Till then we had not done any such huge recruitment in India. Whatever we had done was only on the secretarial side. With that one assignment from Apple Computers, we moved ahead in India." Ma Foi also set up offices in all the big cities in India and seriously started looking at domestic recruitment and sectors like IT, finance and banking. By then, Ma Foi became a closely held public limited company. "We gave equities to our friends, relatives with the promise that we would return at least 20% dividend every year." During the dot-com boom in 2000, Ma Foi also had a dot-com plan and got a lot of venture capitalists investing in it. But then came the dot-com bust. "Thankfully we were affected only slightly by the dot-com bust. We pulled back the dot-com model very soon and convinced our VCs to use what we got -- around Rs 8.5 crore (Rs 85 million) -- in the brick-and-mortar model. With that money, we could spruce up our offices and add more people." 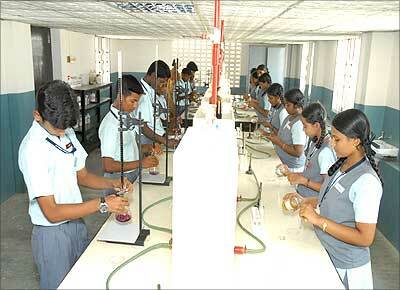 Image: Students at a laboratory in a school run by a trust set up by Ma Foi Consultants. In 2002, Ma Foi set up their first overseas office in Dubai. "In terms of turnover, we were number one in India then, with 600 people working for us. Whenever we travelled abroad we noticed that the staffing industry over there was quite evolved. It also made business sense to have offices abroad. Deputing 10 people in the United Kingdom is equivalent to deputing 100 people in India!" After understanding how the overseas market worked, they had two choices: either to go for an initial public offering, or to look for a global, strategic partnership. "The IPO market was down and volatile then. So, we decided to go for a strategic partnership with global majors. Giants like Manpower, Adecor and Vedior were also looking at the Indian market." "Vedior (the world's leading specialist staffing company from the Netherlands) was much below the two in terms of turnover, but it allowed us much more flexibility. It was a multi-brand company and called itself a federation and corporation. Because it is a federation, a lot of entrepreneurs become a part of it. We run the show and they support us. We had 270 shareholders, plus the VCs, then. It was a majority partnership with 76 per cent held by Vedior and 24 per cent by us. Today, we hold 18 per cent. With Vedior's support, Ma Foi set up offices in the United Arab Emirates, the UK, Singapore, Sri Lanka, Oman, the United States, Bahrain, Kuwait, Qatar, Thailand, Hong Kong, China, and Malaysia. "India is still an evolving market; it is still not a mature market though a lot more clarity has emerged in the last five years. In terms of legality, it is clearer too. On the other hand, the European and the US markets are quite mature. It will take another decade or so for the Indian market to evolve fully." "People are slowly getting comfortable with temporary staffing in India too. In a country like France, almost 80 per cent of the staffing is on temporary basis. People mostly work on contract. But in India, there is a stigma attached to temporary jobs." Image: Ma Foi has been giving back to the society through its corporate social responsibility initiatives. "Definitely the slowing down of the US economy will have an impact on the Indian economy too, but not too much. It may take another six months for the IT and BPO sector to feel the pinch. Sometimes, the impact could be positive; there may be more outsourcing too as they have a problem there." Ma Foi broke even in their first year itself. From placing 30 to 35 people in the first year, now they find jobs for around 5,500 people every month. If the turnover of the first year was Rs 520,000, today, it is Rs 435 crore. In the initial years, Ma Foi grew at more than 100 per cent. The company's compounded annual growth rate has been 70 per cent. "Though both of us were fairly well employed, our dream was to build an institution, do something meaningful and give something back to society in whatever way we could," the Rajans say. The company made a profit of Rs 5,000 in the first year. Vandana Gopikumar and Vaishnavi Jayakumar, two college students had just started Banyan, a Trust that helps rehabilitate mentally challenged destitute women at that time. "We sent the entire money to help them set up Banyan. From that year onwards, we keep aside a part of our profits for charity." As they doubled their profits every year, their contribution to charity too increased. In 1997, they started a Trust called Sornammal Educational Trust (SET) in the name of Pandia Rajan's grandmother. The first effort was to help the students of his village. In 2000, when a school with 100 very poor children run by Hemalatha's grandmother was to be closed down after she passed away, the educational trust decided to run it. "When we saw the poor children, we felt like helping them. We bought a piece of land and built a school. We called it Sornammal Matriculation School. 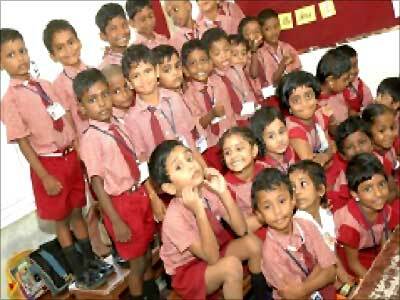 Now we have 650 children, of whom 350 study free of charge." Image: In 1997, they started a Trust called Sornammal Educational Trust (SET) in the name of Pandia Rajan's grandmother. The first effort was to help the students of his village. It was when Hemalatha met the mothers of the poor children that the idea to start self-help groups (SHGs) originated. These women are clustered into groups and are given vocational training so that they could start their own ventures. Training is provided to women to become nurses, DTP operators, housekeepers and even auto drivers. 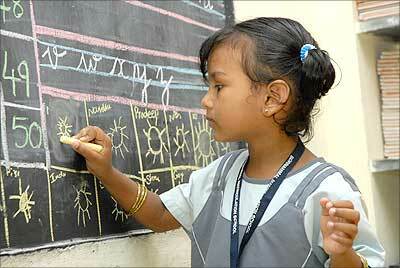 They are also taught tailoring, bag making, handicrafts, embroidery, et cetera. "Till today, we have given Rs 3 crore (Rs 30 million) as loans to these women to start their own businesses. I must say the repayment of loans has been 100 per cent," a satisfied Hemalatha said. The trust has 816 SHGs for 13,128 women in Chennai. In 2004, after working with many NGOs, Hemalatha felt the need to bring all the NGOs under one umbrella, and that was how the Confederation of Indian Organisations for Service and Advocacy (CIOSA) was born. It acts as a good platform for corporates and NGOs to work together. In 2007, the Ma Foi Foundation was formed so that all the corporate social responsibility activities are taken care of by one body. Under the Disha Scholarship Scheme, 1,300 children from corporation school -- 150 are from the Rajans' native town Sivakasi -- get scholarship to study. 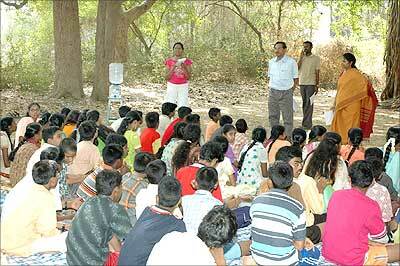 The foundation also runs career guidance programmes for the 8th, 9th and 10th standard students. "Ma Foi Foundation promises a better society as we believe in giving back what we take out and changing the world for the better," the Rajans said. Good going for Mafoi for sure. Thats Very nice . he is very good social responsiblity Man. he is candidate in Virdhunagar MP Post . ungal thoghtiku kidhatha nalla candidate . keep in success with pandiarajan and contribute with virudhunagar MP consitituency also . Good to see that some great candidates are contesting in elections..kudo's to mr.vijayakanth for selecting him as a candidate for virudunagar and all the best for pandiarajan !! !